Mobile gaming is a huge and growing industry, with spending up 18% to $40.6 billion in 2016 according to research firm SuperData – a figure that matched global box-office revenues for films that year. Mobile games based on musicians, however, are… less lucrative. Publisher Glu Mobile had flops with its games based on Katy Perry, Nicki Minaj and Britney Spears, and ditched plans for a Taylor Swift game in favour of an app focused more on social features. Other single-artist games, such as that for Iron Maiden, haven’t troubled the upper reaches of the app-store charts either. The obvious conclusion: the music industry might be better exploring partnerships with the mobile games that are popular and lucrative, rather than trying to build their own. Maiden put their mascot Eddie in Angry Birds Evolution last month, while Sabaton kicked off a long-term collaboration with World of Tanks in June. Now someone *almost* as metal is joining the trend: Shania Twain. Universal Music Group’s in-house brand partnerships division has brokered a partnership with mobile games firm Supersolid, which will see Twain’s new album ‘Now’ promoted within its Home Street game. It’s basically The Sims with more decorating: a genre that’s currently popular on the app stores. Shania will be an in-game character; two videos from ‘Now’ will play on a billboard within Home Street; players will be able to buy a branded guitar and outfit for their characters; and there’ll be an in-game Q&A with the artist herself. All things Shania will only be in the game for 30 days, so if you’re going to play you better get busy! Home Street isn’t a mobile gaming goliath yet: it was released on 12 October and has so far been downloaded 4 million times across iOS and Android. It’s currently outside the top 200 grossing games on the US App Store too, having peaked at 13th place shortly after release. There’s thus an argument that Shania Twain may be bringing Home Street as much value as it’s bringing her, depending on the details of the deal between UMG and Supersolid. 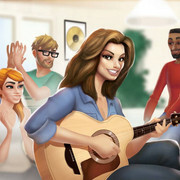 London-based game developer Supersolid has partnered with Universal Music Group Nashville to bring Grammy Award-winning singer Shania Twain to its game Home Street. Twain's appearance in the game coincides with the launch of her latest album, entitled Now. As such, two music videos from the album will play on special billboards in the game. Players will also have the chance to interact with Twain's in-game character as she takes them through new stories, and through a planned in-game Q&A later in November. A new outfit and guitar will also be available to purchase in the game. "Shania Twain is an incredibly exciting guest star to launch our first partnership with. Her long list of awards and achievements reflect her extraordinary success and popularity across all countries and cultures globally," said Supersolid CEO Ed Chin. "We are sure this will only continue to grow with her brilliant new album 'Now' and are delighted to have her as a part of our Home Street community." The deal was teased back in October 2017 when Supersolid closed a $4 million funding round. Home Street has now surpassed four million downloads, and will continue to have new partnership each month. Ask Shania & Win Shania Twain Merchandise! Come On Over and Ask Shania Twain a question for chance to have your question selected by The Home Street Team to be answered by Shania herself! Submit your best fan questions for Shania Twain from now until Sunday, November 12th, 2017 at Midnight EST. Amazing prize packs including official Shania Twain merchandise & exclusive Shania Twain Home Street item bundles are up for grabs if your question is chosen for Shania to answer! Have a question for Shania Twain. Post your question in the comments section before 11/12/2017 at Midnight EST. Check back on Saturday, November 18th, 2017 to read what Shania had to say! I wonder when they'll post her answers to Q&A. I thought it should be on November 18. I don't know. Maybe it's part of the exclusive story mentioned above. Shania Answers! Shania Twain Q&A: Find out which fan questions were answered by Shania & the winners of the Shania Twain prizes! Thank you for submitting your best fan questions for Shania Twain! We received so many great questions, it was tough to pick only 5. Keep reading to find out which questions were answered by Shania Twain and what she had to say to all of our Neighbors on Home Street! The way I begin writing a song varies each time. I am constantly collecting creative writing ideas like lyrics, concepts/storylines or a poetry. Melodies and chord progressions are always coming to me and I collect those till the time comes when I’m inspired to write a song. I draw from this pool of collected music and lyric ideas and often in the process new ideas come in the moment. If I didn’t do music as a career I would like to have been either an architect or veterinarian. I’m inspired by several people I’ve met in my life and couldn’t narrow it down to one. Other female artists tend to be my biggest inspiration because I relate to the demands of building and maintaining a successful career, parenting and wife-ing all at the same time. Juggling fame, family and well being gracefully is admirable. Incredible women like Olivia Newton John, Serena Williams and Meryl Streep are good examples to me of women who give so much to their work, family and the world around them. I would wish to be surrounded more with family. No amount of success can give you the peace and joy of togetherness with those you love and who love you in return. Keeping my music fresh and current is part of my creative fun. Experimenting and exploring new creative territory allows me to evolve constantly so I don’t stagnate artistically.